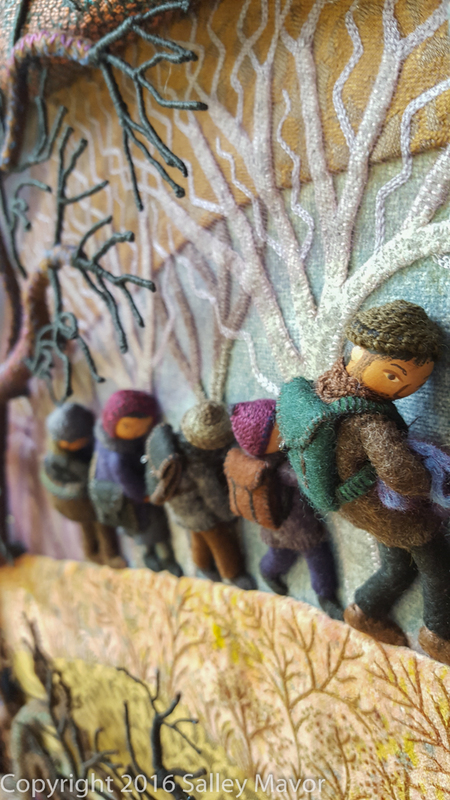 All winter long, while I sat and worked on this new piece, I listened to news stories on the radio about the people who are fleeing their home countries amid war and conflict. Even though Displaced is inspired by current world events, it could very well represent the universal and timeless plight of refugees throughout history. I often think in terms of creating miniature shallow stage sets and with this one, I envisioned a highly dramatic scene. It was important to me that the piece evoked a strong emotional reaction, much like an opera. The heavily burdened figures are a chorus of characters making their way through a black and ominous landscape. To help create tension in the design, I thought of antonyms, such as dark/light, general/personal, despair/hope, trapped/escape, harsh/tender, sharp/soft and horror/beauty. 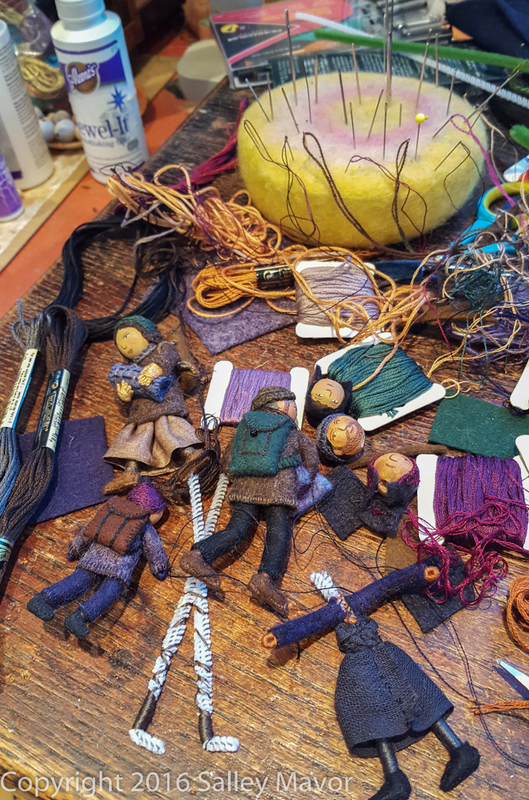 With fiber art, much attention is paid to materials and techniques, as well as the labor intensive process. My intention was to make a work of art that transcends the amount of work invested, and the methods and skill involved in the expression. UPDATE: 18″ x 24″ Posters of DISPLACED are now in my Etsy Shop here. 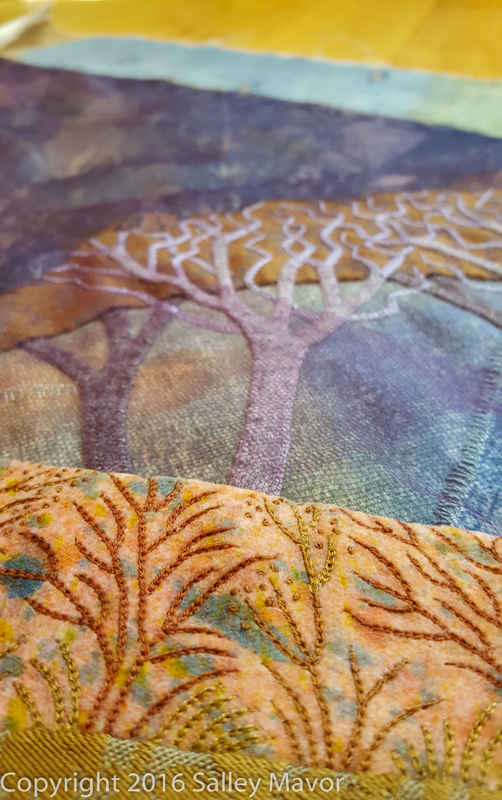 Here are some details of the piece, along with a glimpse behind the scenes in my studio. 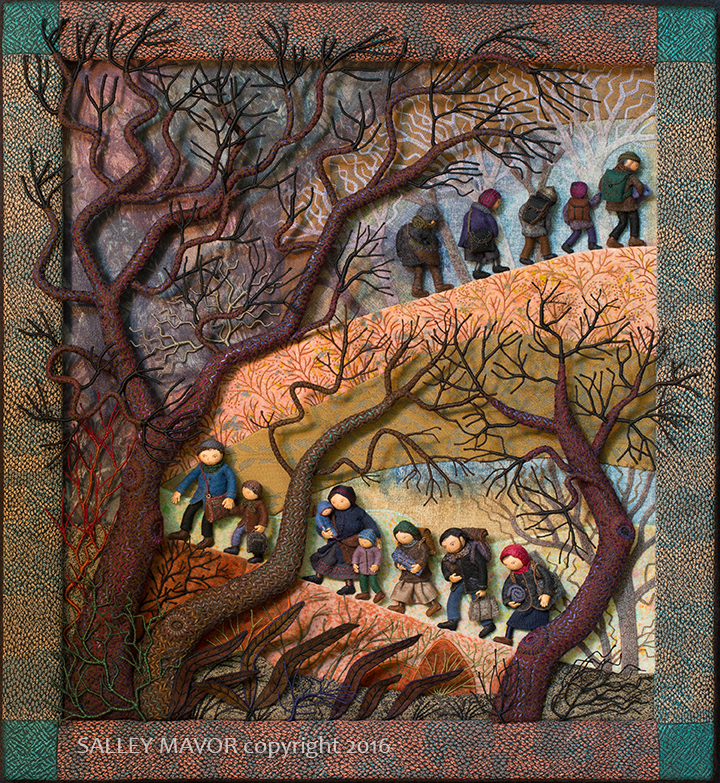 This entry was posted in Displaced, Embroidery, Fabric Relief, Video by Salley Mavor. Bookmark the permalink. This is stunning Salley – thank you. 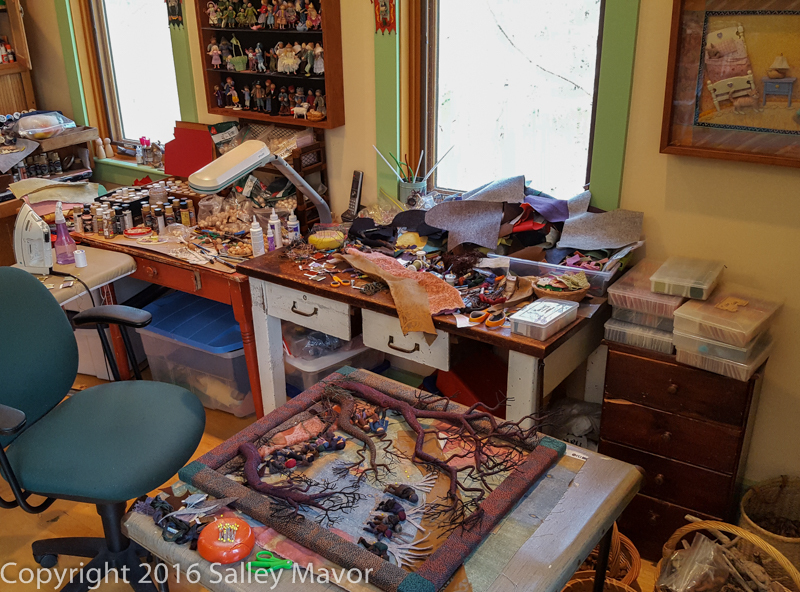 Salley – I’ve watched your work for years and this really touched me. It is stunning and thank you for sharing. It speaks to me. Thank you. A very moving piece to say the least. I have noticed how a lot of refugees walk with their heads down as in your piece. Very sad. I have had many health and job issues and my kids and I have done without a lot of what most think of as necessities, but we have never had to flee our country and everything we know and love or have such violence and killing all around us as so many have. I am thankful every day. I love everything you do but this piece is stunning. It is beautiful. It has social conscious. It is persuasive, and shows the humanity of the refugee “problem”. “Displaced” is a masterpiece. Congratulations. Sally: I absolutely love this work. So labour intensive. Congrats! I think there is enormous strength in the unfussiness….bare bones so suits the emotion in this subject…it leaves my interest peaked and itchy to imagine the content…just like my favorite kinds of story! Very powerful piece and the work is stunning – as someone already expressed. Also inspiring to see your progression as an artist. Salley, your work has drawn out such emotion within me. My heart breaks with the images in the media. I particularly appreciate the way these desperate fragile human beings are walking along the edge of the cliff. It felt like it was the knife edge of their life. Well done and thank you. Susie from Adelaide. Wow, Salley, this is amazing. Your skill as a craftwoman is astounding, as always, but I appreciate especially the artistic elements in this piece. The composition is dramatic and although beautiful, it is ominous. The angles of the sharp leaves and the clawlike, pointy, tree branches, the steep hills and the narrow path that the terrified figures must edge along all instill in me a fear of falling. Yet, even though they are downcast, they are determined. I’d say you were indeed successful in provoking an emotional response. Thank you for sharing. I hope to see your show in the fall. Very powerful and very beautiful. Beautiful. It makes me think of another dichotomy:compassion/fear. They are not antonyms but in today’s world they seem to work that way. Thank you for making this piece. Love this piece it has so much feeling in it. It should do well in your next show. Keep going on this. This is so evocative of the situation in Syria, Turkey and all through Europe. The long, uphill trudge to a new life. I hope that this piece that you have created will become widely known. Your talent is unique and you are so experienced now in creating these miniature people. Beautiful and takes my breath away. Thank you. Amazing, beautiful and powerful! Love your work! This brought tears to my eyes. 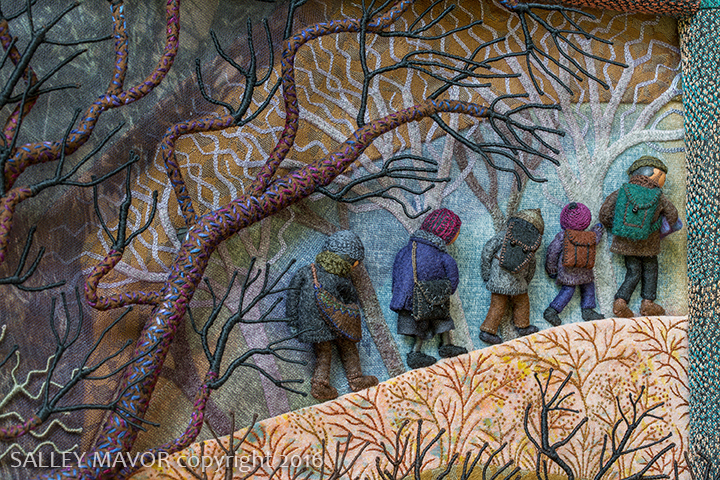 The figures are so down-trodden, I “love” how the figures on the upper level have their backs to us and the shadows (real or drawn, painted, or embroidered) of the branches. What is further interesting and causing tension is the doll within the context of serious subject. I’ve loved your work for years, Salley. Your new piece is stunningly beautiful, and of our time. It will make an impact on those who see it. It brings tears in my eyes but it’s also beautiful. Waouhhh ! J’admire votre travail depuis longtemps. Cette pièce est magnifique et je ne peux m’empêcher de vous féliciter. Vous êtes une grande artiste ! Merci pour cette beauté qui prouve que l’on peux faire de grandes choses avec des petits bouts de riens. Museum piece, for many to see and ponder on. Stunning. You have captured all the emotions of sadness and helplessness I feel about the the world’s problems. It is a great work of ART. I too listen to Public Radio and other news mediums daily and think about the stories I hear of strife, sadness and sometimes hope. Thanks for this political piece. Oh Salley, this is beyond amazing. It brought up so much emotion for me , took my breath away and brought tears to my eyes. Beautiful expression of strength, courage, sadness and fear. Seeing this piece of artwork helps us all to become more empathetic and compassionate. Thank you for creating and sharing it. This is so special! I felt the heaviness and the movement of the characters. Everything already said, and I love the winding movement as if in a labyrinth, the feeling of constant motion as a necessity with no place to rest, unutterable fatigue. There is also deep sorrow and yet a glimmer of hope as they continue to move forward. Thank you for sharing this wonderful piece. Very touching and evocative. The mother with her baby and child…choked up! Thank you for expressing so many emotions and questions with your artwork. You are such an inspiration! I could feel the emotion of refugees in this piece..you are truly an artist ..
You could do a book on this piece alone. It is heartbreaking and gorgeous at the same time. Stunning and moving. I am surprised their are no boats. This piece leaves very powerful feelings of sadness. This is absolutely stunning, Salley. As the grandchild of Armenian refugees displaced by genocide this evokes so many emotions. Thank you! Salley, I have been inspired by your techniques and style to find my own storytelling style. I have admired your figurines and sets, but this is the first creation that moves me to speak up. I understand it was inspired by the current Syrian refugee plaint, but it speaks to me of my Russian grandparents’ and parents’ fate after WWI, the Russian Civil War and WWII. 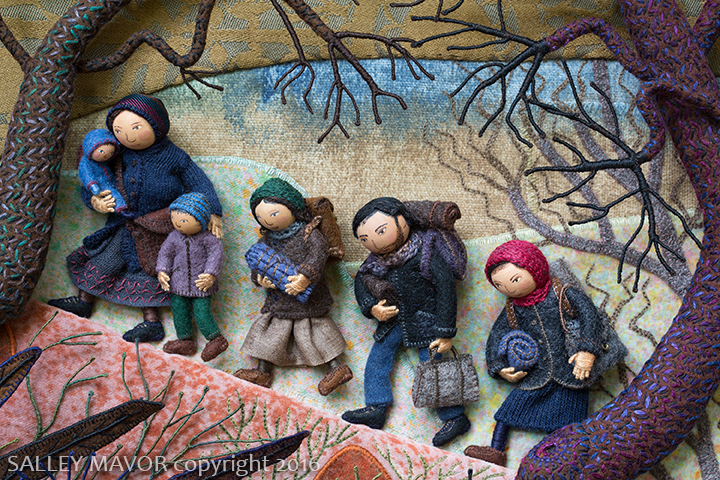 This piece truly expresses the plight of the modern expatriates, refugees, and exiles. This is just so well done. I love working on small things and just love seeing the progress you make. Yes this could be the refugees of all the years down in history. A work of art for sure. 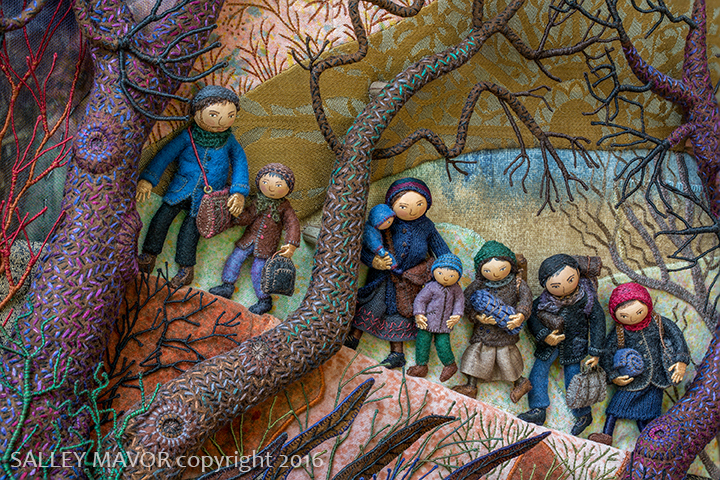 I feel like such a stalker going to your fb page from the miniature group the clicking on the link to your studio blog. LOL. WOW what a talent you have. I can’t say how much I just love your work. Thank you so much and welcome to my wee world! I have only just discovered your work and am so impressed, not only by the skill involved in actually working the pieces but also in the story they tell and the way they reach out of the canvas to speak to the observer. Thank you so much for sharing them online.